Last weekend, two members of CNEWA’s development team, Philip Eubanks and Thomas Moore, paid a visit to Holy Disciples Parish in Puyallup, Washington, where they spoke at the weekend Masses. They also spoke at Our Lady of Good Counsel in Eatonville, Washington. They’re continuing their travels this week through the greater Seattle area, visiting churches and meeting donors. We love getting out to parishes around the United States to help tell CNEWA’s story, It’s an opportunity to bring the good news of the Eastern churches’ tireless efforts to alleviate poverty and despair across the Middle East, Northeast Africa, India and Eastern Europe. It’s also a great way to thank all who continue to support the work of CNEWA. If you’d like us to visit your parish or community, let us know! Drop a line to our development associate, Christopher Kennedy: ckennedy@cnewa.org. Last week, we looked at “charity” as it is understood and practiced in Judaism, Christianity and Islam. We saw that care for the weak, the poor and the suffering was central to each of these faiths, although each approached it in a slightly different way. This week, we are looking at how CNEWA embodies Christian charity as it responds to the command of Jesus to “love one another as I have loved you” (John 15:12). The command to love one another is not an abstract one for Christians. Again and again in the Gospels, Jesus manifests love by showing compassion to those around him. When in Matthew’s Gospel John the Baptist sends messengers to Jesus to ask if he is the “one to come,” Jesus responds by saying “the blind see, the lame walk, lepers are healed and the poor hear the good news of the Gospel” (Matthew 11:4ff.). Jesus sees his identity and mission as coming to those who are burdened under sickness, poverty, oppression and sin. Caring for the poor and the outcast is not, therefore, merely a side event to being a follower of Jesus, nor is it a theoretical obligation. It is central to salvation. In Matthew’s Gospel, salvation or damnation are presented as dependent not on orthodoxy, not on liturgical practice, but on how one treated the poor. In this Gospel narrative, whether one enters eternal life or punishment depends entirely on whether or not one fed the hungry, gave drink to the thirsty, clothed the naked, took in the stranger and visited the imprisoned (Matthew 25:31-36). For over 90 years, CNEWA has taken that teaching to heart, making Christian love visible by caring for the poor. It is a love that extends far and wide. 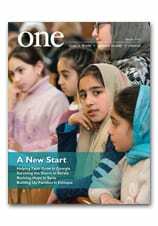 Recognizing the challenge of Jesus, “if you love only those who love you, what thanks can you expect” (Luke 6:31), the cover of CNEWA’s publication ONE even proclaims that we serve the one “God, one world, one human family and one church.” Originally working in the Middle East, CNEWA’s mission has expanded to also serve those in need in northeast Africa, Central Europe, the Caucuses and India. The reach is extensive. CNEWA partners with the Eastern Catholic Churches to support hospitals and clinics, to educate children as well as church and community leaders, to care for the handicapped and the outcast. For the past several years, CNEWA has been intensely involved with the plight of refugees in the Middle East—a situation that has been described as the largest humanitarian crisis since World War I. This is the all-embracing love of Christ in action. Philanthropy is part of all the great religious traditions of the world, and each carries it out differently. The “Golden Rule” of “do to the other as you would have others do to you” exists in every religion. As we have tried to show, love—unconditional and universal love, even of enemies—is a central and unique characteristic of Christianity. CNEWA tries to make that love visible and effective in the world in which we work.